Ah. It’s this stuff, going back about two years. It’s the stupid MPAA’s attempt to stop piracy of copyrighted materials, via the Center for Copyright Information (see FAQs about this vague program). EMI is also part of the consortium contributing to this CCI sniffing program. But where’s Comcast, you ask? 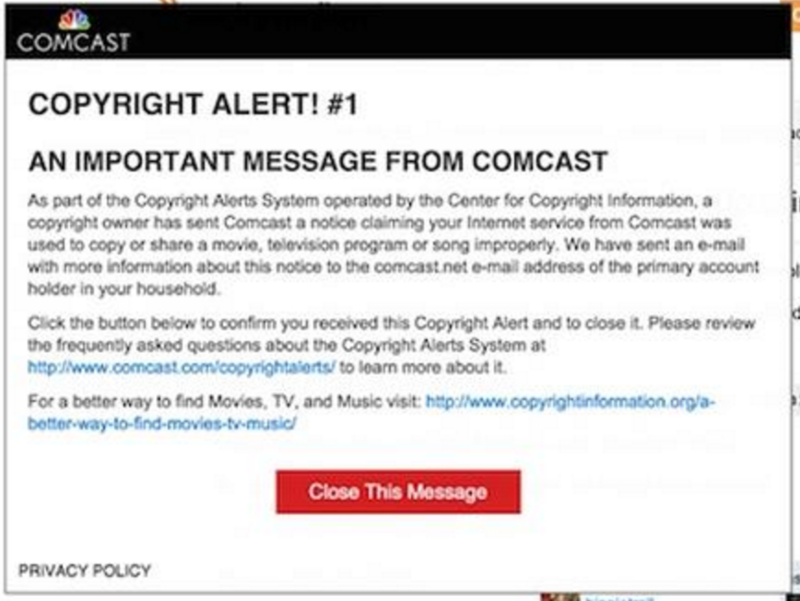 Universal Studios is a Comcast company, which means Comcast is part of the MPAA. This is one of the key reasons why ISPs should NOT be content producers, and vice versa — they have a fundamental conflict of interest in serving digital pipe versus offering content. Truly effective net neutrality would have insisted that ISPs are carriers and must act independently of content providers. Given Sony Pictures’ MPAA membership, I wonder if buried somewhere in those emails allegedly hacked by North Korea there’s more about this sniffing program? Does make one wonder about the MPAA’s role in relation to U.S. foreign policy, given the White House response to Sony’s hacking. Rayne, is there any to block an ISP (Comcast in my case) from acting as our warden. I get all foggy when figuring out how to encrypt searches and viewing. If they’re upstream does using TOR and HTTTP Anywhere even affect the ISP’ s ability to snoop, along with all our other friendly government spys. Doddering minds need to know. It comes down to how much time and effort (time being the critical component) you want to put into the project. They have on the other hand, essentially infinite resources to use against you, should they choose to — but not infinity the skill or wisdom. It is beyond the scope of this short reply, but there are some simple things you can do such as change your dns servers from your ISP’s default to use any of the freely available dns servers. This stops the ISP from automatically tracking your web travels. (The ISP has to go to extra effort to figure out where and what you visit). You have to then trust the other dns server folks. Use search engines that are encrypted AND do not send your requests back to their server by way of the “site address” you see in your url field. Make certain you keep up with the security updates for all of your software. Trojan horses turn up in unexpected places. Sony Pictures is a content provider, but not a carrier, so fears resulting from the mixing of the two should be ameliorated. Sony is forbidden from being a carrier because it’s a foreign company. But they do end up being a mix between content providers and consumer electronics devices. Your fears of Sony should probably not be that they would be involved in some nefarious league with government surveillance, but rather that they are wholesale believers in addictive technology. Sony isn’t an ISP, but it does have an entertainment network called PSN. It may/may not be directly sniffing on PSN using CCI’s tech, but it paid for CCI’s tech as part of MPAA. Let me clarify this, since it apparently wasn’t clear to you: I mentioned Sony because of all the MPAA members, only it has had its emails disclosed. 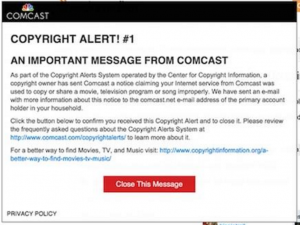 In them may be content between MPAA members including Univeral(Comcast) about the CCI technology. The White House’s defense of Sony as a foreign-owned firm was odd, which I said at the time — but if the White House is really supporting MPAA members as a tool for tracking info/content deployed across networks, that’s an entirely different kettle of fish, and it’d be foolish not to take a deeper look at Sony as a proxy for the other MPAA members. Especially considering that it was Sony that released the “Root Kit of All Evil” as one group reported it. I wonder if the Tea Partiers will respond to Paul Ryan joining with Chris Dodd and Joe Biden in this legislation… The tea parties supposedly got rid of Speaker John Boehner because he kept working with the Democratic Party, against their wishes, and as Ms. Emptywheel has shown here, Speaker Ryan starts off his term by joining with the Hollywood branch of the Democratic Party. I don’t think Hollywood is really aligned with a party per se. It picks the entity most favorable to its business practices (hello, fascists). What’s clear to me — having written here previously about Hollywood’s gross sexism and racism — is that Hollywood is NOT liberal. Having extremely few women and persons of color across its major studio management means Hollywood resembles US manufacturing management and Congress in its makeup, and Hollywood resembles these same entities in its practices. Beyond a few exceptions, the Democratic Party and s not really noted as ‘liberal’. Your tech search returned 43 meanings. & it’s not very helpful. The quest for answers would continue but I got bored with it. Carry on.